Tomorrow morning I’m setting out with two friends on the greatest physical challenge of my lifetime. We are cycling from London to Paris, a distance of close to 250 miles.I’m doing this for my birthday to raise money for the AD Scholarship Fund. We were able to give away $12,000 in scholarships this year so I’ll work on raising some money to re-fill the pot. The first day, we’ll cycle down to the UK coast which is around 70 miles and full of hills. That will be the most challenging day. We spend the night down there, close to the port and then hop on a ferry the next morning. The ferry is four hours long and we lose an hour so we won’t be able to get much cycling in the second day, but that will also give us some time to recover. Most of France will be lovely, quiet country roads and small villages to cycle through. 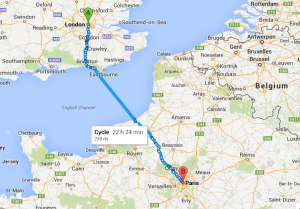 We’ll spend the second night in Forges-les-Eaux and hopefully by the third night we’ll be fairly close to Paris. Saturday is my birthday and if all goes as planned, we’ll be cycling up the street to the Eiffel Tower that morning, our final destination! One night in Paris and we’re back on a train to London and for that trip – our bikes get to ride too! I’ll post photos when I get back. If you’d like to sponsor our ride, please donate through our website. Thank you very much for your contribution! ‹ Announcing our 2013 Scholarship winners! Emma, I am so proud of you! What a nice way to combine your goals with those of the ADSFund! And how generous of you… Thank you! The world needs more people with a kind heart like yours. Is she the same ”Emma Miller” from ‘DEVIL’S PLAYGROUND”?